The much-anticipated annual Christmas Exhibition showcasing the handmade beadwork, embroidery, telephone wire, clay and wood decorations of the African Art Centre opens on Thursday 29 October. This exhibition fulfils the Centre’s mission to facilitate innovative products through creative skills development initiatives which enable local crafters to generate sustainable income through their art. The African Art Centre development projects enhance the existing skills of crafters residing in urban, peri-urban and rural KwaZulu Natal communities, and bring to public attention the wares of new emerging talent. This year the Centre presents exciting new work by young creatives currently being trained through the African Art Centre’s outreach Velobala Jewellery Design classes. Weaving in telephone wire for the first time, Wonder Msane, Phumlani Mbhele and Phumlani Madela have produced a range of ornaments in the formation of stars, hearts and angels executed in specified colour combinations. 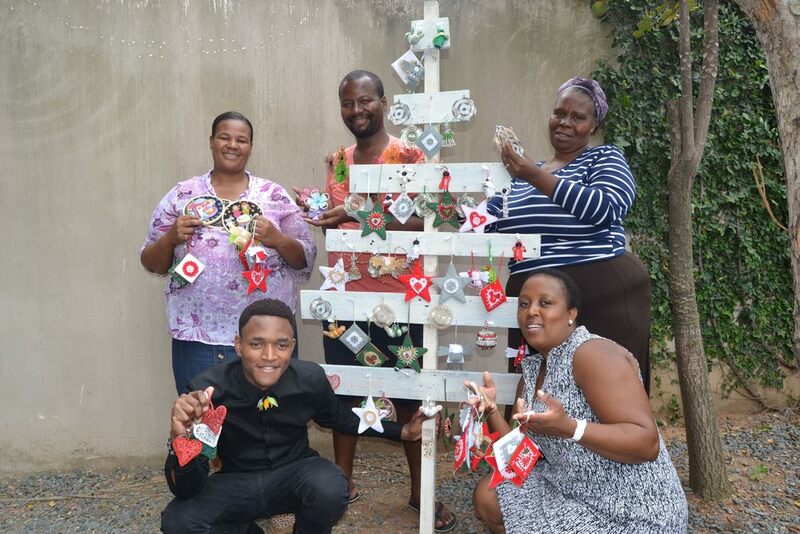 The telephone wire decorations will be available alongside the beaded, embroidered and wood decorations produced by well-known African Art Centre crafters; Happiness Dladla, Dumsile Mathe, Thokozane Mathe, Agnes Mthembu, Mavis Jali, Augnatia Khanyile, Tholani Mchunu, Hlengiwe Mbhele, Mbaliyethu Mabuza, Ntokozo Mseleku, Mbaliyethu Mabuza and Sbusiso Maphumulo. A wide range of products have resulted through a series of workshops facilitated by Leonie Malherbe, Busi Shinga and Nozipho Zulu. A novel feature at this year’s exhibition are uniquely African-designed beach towels, the result of a partnership between Mr Price Home and four African Art Centre artists, Sibusiso Duma, Nonotobeko Jilajila, Mbali Mabuza and Timothy Mlambo. The beach towels represent the varied skills of the artists; Timothy is the wood carver and creates wonderful mythical creatures, Sibusiso produces intricate paintings done in the pointillism style, Nonotobeko creates wonderful lino cut prints and Mbali is a deft hand at applique embroidery. Early this year Mr Price Home hosted a workshop with the artists and a Mr Price Home designer. The artists produced their artworks which were adapted by the designer to suit the manufacturing restrictions of towel weaving. “Championing great design is important to us; it is who we are and what we do at MRP Home. This Colab under the auspices of our “Design doing Good’ program, will see a portion of the proceeds from the sale of every beach towel, being donated back to the African Art Centre in order to facilitate emerging artist development,” says Mr Price Home Merchandise Director, Yanni Vosloo. This new range will be in Mr Price Home stores from the 12 November. Whether you seek affordable handmade Christmas decorations such as angels, stars, hearts, tea lights with African character, or other traditional and contemporary African art, usher in the Christmas season in African style at the African Art Centre for the opening of the Christmas Exhibition on Thursday 29 October at 17:30. The exhibition will be opened by a special performance by local icon Madala Kunene with his unique blend of jazz and Nguni folk blues. The exhibition closes on the 24th December. For additional information, please contact the African Art Centre on 031 303 4634, or visit at 94 Florida Road, Morningside.